Below you will find an overview of frequently asked questions. Before sending us a request, please make sure the questions is not listed below. Please describe the problem you are facing in as much detail as possible. In order to help you most effectively always mention your operating system and the version of Excel (for ModelRisk questions) or Primavera/Microsoft Project (for Tamara questions). By clicking the paperclip icon in the form on the right, you can add an attachment. ModelRisk comes in three editions: Standard, Professional and Industrial. The Standard edition requires very little expertise in risk analysis, and reviewing some of the training videosa> should get you started. To make proper use of the Professional Edition, you should be a competent risk modeler or receive some training. The Industrial Edition is best suited for risk analysts with considerable experience. What is the difference in functionality between trial and licensed versions? 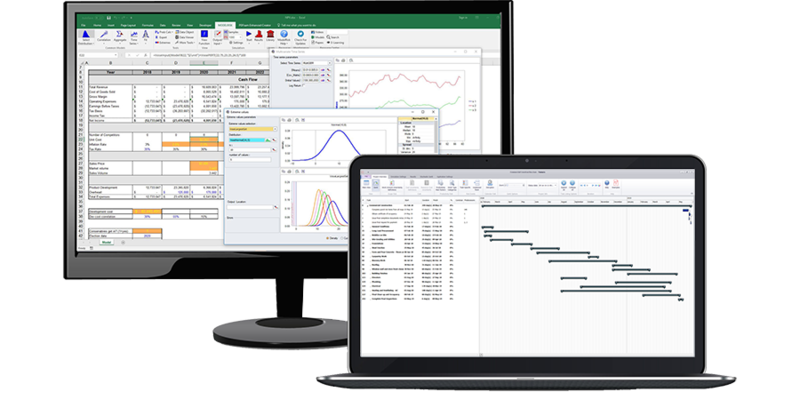 The trial version is based on the Industrial Edition of ModelRisk, so it provides all the features you will find in the Standard, Professional and Industrial editions. Refer to this page for an overview of what each edition offers, or consult the help file for which editions contain a specific function or interface. The trial version of ModelRisk has no constraints on model size, simulation speed, etc. However, the trial version has a delay built in that will require you to wait a few seconds before a simulation starts, and the graphs displaying the results have a watermark. The student version is based on the Industrial Edition of ModelRisk, so it provides a complete set of features. The student version of ModelRisk has no constraints on model size, simulation speed, etc. However, the graphs displaying the results have a watermark.